Five photographers from Russia, England and Germany arrived to hold a photo session on the Reindeer Herder’s Day in Salekhard. They are taking pictures of representatives of indigenous peoples of the North in traditional clothes. The taken pictures will be printed in the book, the project name “Faces of the outgoing world, the outgoing era”. The essence of the project is to collect portraits of people of disappearing ethnicities in one album. A group of photographers have been traveling around the world for four years, they have visited many countries. 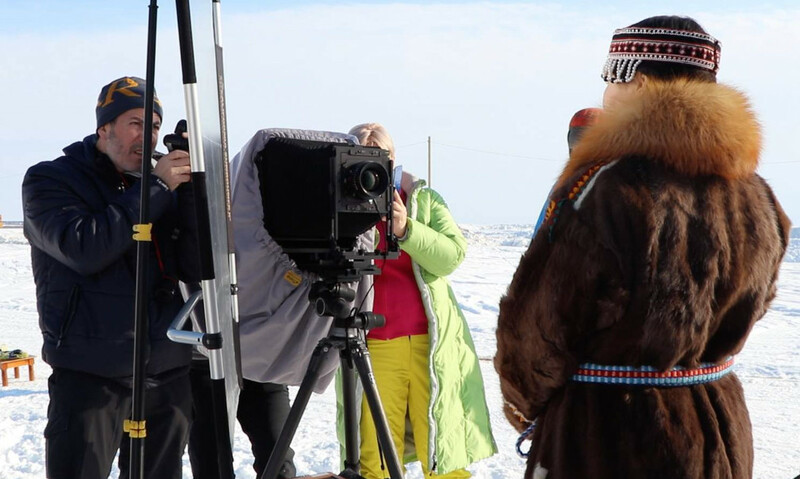 In Yamal the photo artists will make 120 photographs. India will be the next point on the route. According to the photographer Jan Schlegel from Germany in his interview to a correspondent of the news agency “Sever-Press”, people live in the time of great changes because of globalization. No matter where the photographers go, traditional culture is gradually disappearing. Tribes and ethnicities gradually become similar to each other. They lose their identity. Unique culture is being lost. When he travels, he sees this phenomenon. The goal and the mission of the photographers are to preserve beauty and uniqueness of such culture”. As we should note, the photographers take pictures on film cameras with a rare Petzval lens that is more than a hundred years old. Thanks to this lens they create unique and high-quality portrait photographs.